(CNN) - Intense bands of snow whipped parts of the Northeast on Wednesday, threatening dangerous driving conditions and more power outages as the second nor'easter in a week crept up the storm-weary East Coast. About 38 million people from New Jersey to Maine were under winter storm warnings and watches, just days after last weekend's deadly "bomb cyclone." More than 2,600 flights were canceled, according to FlightAware. Snowfall rates of 1 to 3 inches an hour were reported in much of New Jersey, the New York City area and parts of southern New England, the National Weather Service said. By late Wednesday afternoon, parts of northern New Jersey and Connecticut and New York had recorded than 11 inches of snow, the National Weather Service reported. West Milford, New Jersey, reported 16 inches. "Heavy snow will begin to wind down in New York City, but parts of New England will continue to be hammered through the overnight hours," said CNN meteorologist Taylor Ward. The storm could cause minor to moderate coastal flooding in the northern mid-Atlantic and Northeast, and winds and snow could bring down more power lines, adding to the thousands of outages that remain from last weekend. Parts of New York and New England will continue to see snowfall at rates of 1 to 3 inches per hour into the overnight hours, forecasters said. Massachusetts Gov. 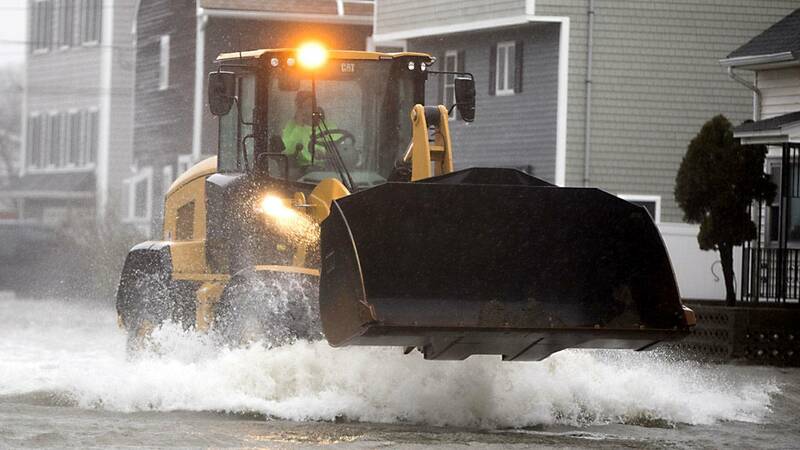 Charlie Baker urged residents to use caution. "Everyone should expect a long and challenging commute this evening," Baker said. "Stay off the roads during the height of the storms this afternoon if you can." The storm is expected to pack wind gusts of 30 to 50 mph. While a far cry from the 90-mph gusts recorded over the weekend, the strong winds could impede efforts to restore power in the region. Philadelphia, New York and Boston could see fair amounts of snow, but areas inland could receive even more. Philadelphia could get about 8 to 12 inches, according to snowfall estimates from the National Weather Service, with especially heavy snowfall possible through 7 p.m. City schools were closed Wednesday. Pennsylvania Gov. Tom Wolf announced a state of emergency for several counties in preparation for the storm. New York City could see 8 to 12 inches of snow by Wednesday evening, according to Ward. In New England, Interstate 95 could be a key dividing line, with points west due to get as much as 2 feet of snow, and points east getting rain and lower amounts of snow, CNN meteorologist Dave Hennen said. The Boston area may receive 6 to 8 inches of snow by Thursday morning, with areas as little as 20 miles inland perhaps getting 12 or more inches. But if the rain/snow line moves farther east, Boston's snow accumulation would rise. Boston Mayor Marty Walsh announced public schools will be closed on Thursday. The snowstorm came with a rare accompaniment of lightning in some parts of Pennsylvania, New Jersey and New York, the weather service said. "Thundersnow," as the phenomenon is known, is snow paired with lightning and resulting thunder. To happen, the air layer closer to the ground must be warmer than those above but still cold enough to create snow. Ground temperatures in the winter are usually too cold for thundersnow to occur. How is it affecting travel? Much of the 2,700-plus flight cancellations involved major airports in the Northeast, such as Newark, John F. Kennedy, LaGuardia, Boston and Philadelphia, according to FlightAware. As for ground travel, New York City's Office of Emergency Management issued a hazardous travel advisory urging New Yorkers to "take mass transit if possible and allow for extra travel time." Amtrak has modified some of its services between Washington and Boston.